The Peak District is an outstanding part of the country as is perhaps illustrated by the huge amount of leisure seekers that visit the area. The lovely spa town of Buxton is great but is on my ‘avoid’ list, not because of the town itself which is quite lovely but because I, and other Peak District walkers I’ve spoke to always claim the same thing – it’s always raining there and in the surrounding area! I very much like the Castleton and Edale areas in the White Peak. Castleton like Matlock can be a honey pot for tourists but it’s quite easy to get into the hills away from people even on busy days. Here’s a little gem that many mayt have overlooked however, Hayfield close by Chapel-on-le-Frith. 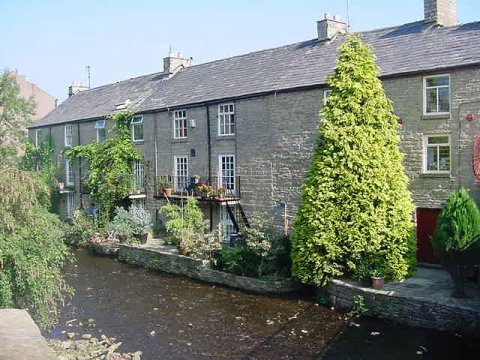 Such a beautiful little village, it has access on to the Pennine Way and there are some terrific views from there. 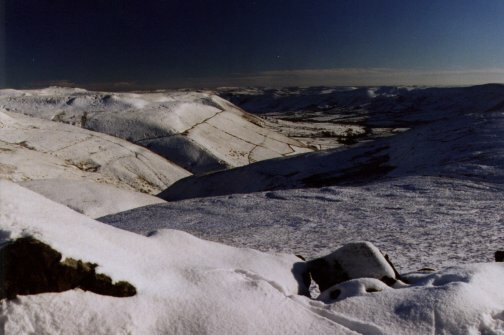 Up on the moors there, Manchester can be seen in the far distance and the walk skirting the edge of Kinder Scout passes the ancient Edale Cross and Jacobs Ladder waterfall. There are also the remnants from one or two crashed WWII RAF aircraft still lying on the moor. The spectacular Kinder Downfall can also be seen where the water actually, famously blows upwards! Go to Hayfield, enjoy one of England’s truly spectacular walks and enjoy the facilities of the village afterwards. I thoroughly recommend it. Hayfield is absolutely beautiful. I was born there. Now live in the US but going for a trip this summer. I’d say you are very fortunate having been born in such a lovely place, Elaine.